Free and enslaved blacks, as well as sympathetic whites, assisted runaway slaves by offering refuge, advice and legal assistance. Accomplices risked ostracism, imprisonment and death. Fugitive slave laws required all citizens to report runaways to authorities. People who "enticed" slaves to escape or aided fugitive could receive years in prison. Anyone suspected of enticing a slave to flee could be prosecuted. 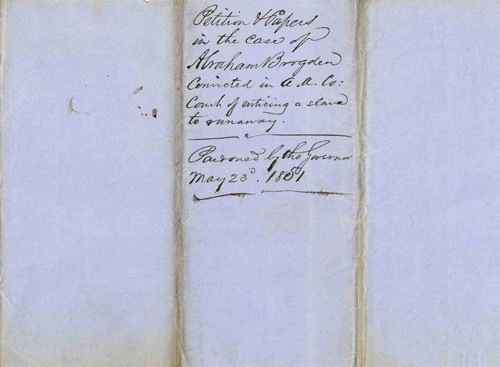 The story of Ann Matthews, a white women from Baltimore jailed for encouraging her neighbor's slave to escape, reveals the aggressiveness of Maryland's pro-slavery sentiments. Matthews received a ten-year prison sentence in 1848, even though Margaret, the slave she allegedly encouraged, never attempted to run away. Detractors in the community wrote to Governor Philip Francis Thomas that Matthews was "a perfect pest" and "a terror." However, the jury sympathized with Matthews, recommending that she be pardoned because she was "no abolitionist or in any way hostile to the Institution of Slavery." Matthews was pardoned, but died three years later. The fear of separation from friends and family was a common motivation to attempt to escape. Abraham Brogden, a free black, worked in Anne Arundel County near his enslaved wife, Cinderella. The Brogdens fled together in 1848, fearing that Cinderella would be sold to a distant master to settle new owner's debts. Their attempt failed and Abraham was sentenced to the Maryland Penitentiary, while Cinderella was sold outside Maryland. Sympathetic Annapolis residents wrote that Abraham's "crime was in endeavoring to set his wife at liberty." Sadly, Cinderella passed away before Abraham was pardoned in 1853. Born Ann Hatzell in Pennsylvania in 1805. Married with one daughter, Ann Jane. Arrived in Baltimore City with her husband no earlier than the 1830s. Resided on Light Street, then Hill Street, then 130 Lee Street, then South Howard Street, Baltimore. Died December, 1851. In the 1840s, Ann Matthews was a middle-aged white woman living near a Society of Friends Meeting house and the Sharp Street Methodist Church. In 1848, she was charged in with enticing "Margaret," a twenty-three-year-old slave belonging to a local brickmaker named Washington Rider, to run away and also to steal on October 12, 1847. Ann and Mr. Rider were neighbors; her address at the time was 130 Lee Street, while his was 118 Lee Street. Ann's case was brought before a jury of the Baltimore City Court in the September Term of 1848. The jury felt compelled to convict her under the law even though Margaret did not in fact run away. Ann was sentenced to serve ten years in the Maryland penitentiary, but the jury as well as a group of fellow citizens petitioned Governor Philip Francis Thomas recommending her pardon due to her advanced age and widowhood. A second petition to the governor signed by sixteen of Ann's fellow citizens asked for pardon "by every consideration of humanity and of public justice." A third petition signed by fifty-nine people requested a pardon because Ann was "far advanced in age and her incarceration in prison would be an act of great hardship if not barbarism." At the same time, however, Mr. Rider and twenty-seven other citizens signed a petition describing Ann was one of "the very worst characters and is a terror to her neighbors." Governor Thomas heeded the more favorable petitions, issuing a pardon on November 2, 1848. His handwritten note stated that Matthews was "pardoned on condition of keeping the peace for 12 months and giving security thereto." The Secretary of State's Pardon Record states that the reason for her pardon was that, because of her advanced age and poor health, "her life would be endangered by incarceration in the Penitentiary." On December 10, 1851, Ann Matthews wrote her last will and testament, stating that she was ill and wished to settle her affairs. Leaving her house on South Howard Street to her daughter Ann Jane, she passed away by the end of the month at the age of forty-six. Philip Francis Thomas, who rescued Maryland from the insolvency of his predecessors, was born in Easton on September 12, 1810. His father, a Talbot County Federalist, practiced medicine on the Eastern Shore for more than fifty years. His mother, was Maria Francis, whose ancestors had settled in Talbot County before 1720. Philip Thomas received his early education at Easton Academy, after which he became a student at Dickinson College. As the result of his participation in some college pranks which were detected, he was suspended after two years of study, so he returned to Easton, where he became a law student in the office of William Hayward and in November 1831 he was admitted to the Bar. Abraham "Abram" Brogden, a free black laborer, was descended from a well respected, free black family that had lived in Anne Arundel County for decades. His grandfather, likely named Abraham, was born near the head of South River. Brogden worked on the Anne Arundel County farm of Mr. James Curly of Baltimore City. Brogden was still working at Curly's farm in 1840, while living in Baltimore. He resided in Ward 10 (as seen in an 1836 map). Although the street is not currently known, he lived in the northern part of Ward 10, which later became Ward 12 (as seen in an 1866 map). In 1840, the census recorded him as "Abram Brigton," in the twenty-four to thirty-five age group. He had one other person listed in his household, a free black woman in the same age group. Born around 1824, Cinderella Brogden was enslaved on the farm of George F. Worthington in Anne Arundel County. The farm stood near Brotherton, a postal village about ten miles northwest of Annapolis, near the Severn River. Her husband, Abraham Brogden, was a free black who lived in Baltimore City, and worked in Anne Arundel County. On Thursday, December 21, 1848, Cinderella fled her enslavement with the help of her husband. Thomas D. Marriott, a friend of the Brogden family, wrote that Cinderella "was about to be sold (under execution) for her masters debts, when Brogden ran off with her," a clear motivation for the escape. According to Marriott, Cinderella would have been sold outside of Maryland. Worthington's overseer, Edward H. Brown, immediately suspected Abraham, and placed a runaway advertisement in the Baltimore Sun the following Saturday, December 23rd. The advertisement stated that "She has a husband living in Baltimore by the name of Abram Brogden, who is supposed to have taken her away from home." Brown set the maximum reward for Cinderella's return at 100 dollars, and noted that she took a variety of clothes with her when she fled. She was apprehended and admitted to the Baltimore jail on December 22nd, just one day after she had fled, and a day before her runaway advertisement appeared in the newspaper. While she was held in jail, the Baltimore Sun ran the advertisement, and eight days later Cinderella was given back to her owner, Worthington, by the order of H.R. Robbins of the Baltimore jail. Sadly, Cinderella was sold South, and passed away before her husband's pardon in 1851. Cinderella was not the first Brogden to escape from George F. Worthington's farm. 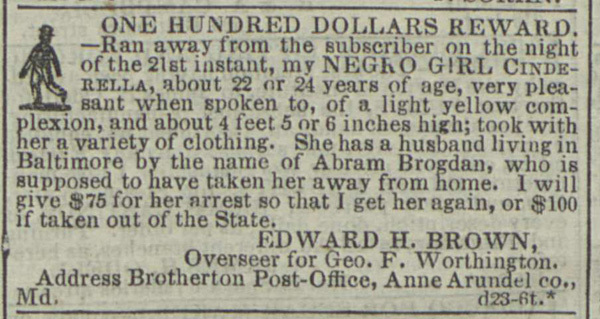 In 1852, Eliza "Brogdon" fled, prompting a runaway ad in the Baltimore Sun. Worthington described Eliza as intelligent and literate, and "may have papers prepared by herself."